﻿ Listen to your customers and ask their opinion; you can learn a lot from them. 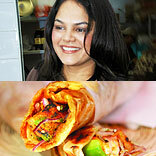 In a candid chat with Franchise India, Payal Saha, Owner, The Kati Roll Company (TKRC), talks about her growing up years, how she started with the concept of restaurant and how she evolved with the restaurant. I have always loved food — the ingredients, the cooking process and the presentation. I grew up in Calcutta, and unfortunately, the food in our house was terrible. I used to spend a lot of my time eating at the street carts and, of course, kati rolls were always my favorite. When I migrated to the US for my husband’s job, I missed kati rolls the most. Then I thought that if I missed them so much, other people must also be missing them. That’s where the idea of The Kati Roll Company (TKRC) stemmed from. When I moved to NYC with my husband for his job, I was not working due to various visa issues. I knew, however, that being in the hospitality business was my calling. I remember thinking at seven years old that I wanted to own a restaurant. So when the opportunity arose to start anew, I knew that I would finally be able to pursue my dream. The beginning stages were very tough with long hours and limited resources. In the beginning, I started the business with my own funds and some rose through friends and family. Eventually, however, things started to turn around and I started to really enjoy the business aspect of owning a restaurant. Today, I can’t imagine doing anything else. However, as we expanded into our current four locations – three in New York City and one in London – we used traditional routes of obtaining bank loans, etc. We opened our first location in NYC’s eclectic Greenwich Village because I knew that I needed a location that wasn’t too big or too small and one that had a lot of foot traffic that was open to diverse cuisines. Greenwich Village is close to New York University and has a lot of bars and clubs nearby. It also has a long history of attracting people with an open mind. We chose a space that was centrally located in Greenwich Village and was easily accessible by a number of subway lines. Our target customer is the urban professional looking for a grab-and-go meal. All of our locations have limited seating and are meant to be casual eateries. We do attract families, but following the makeup of Manhattan’s demographic, 70-80% of our patrons are adults. Considering we are located in New York City, it was obvious that non-South Asian people would be trying our cuisine. To our credit however, prior to our opening, people related ‘Indian’ cuisine to curry dishes and naan. We were the first eatery in the US to introduce Indian cuisine in a new, portable and fresh format. The idea caught on with New Yorkers and recently kati rolls have been showing up on the menus of Indian restaurants across the US. I’m sure we had something to do with that. Since kati rolls are known as street food, I wanted to replicate that idea in the restaurant – the idea that you are eating at a street vendor in India without being too obvious about it. I also wanted the interiors to have a cool, urban look to fit well within NYC’s inherent vibe. Hence, the interiors are free-flowing with nothing too precious or precise inside. The walls are covered in peeling vintage Bollywood movie posters, the tables and chairs are mismatched and made of recycled materials. The lighting is casual and the entire space has been designed to age and weather with time and use, adding to its tactile character. Our signature colour is orange and we chose that particular colour since it stood out in the grey-toned Manhattan landscape, making the eatery immediately recognisable from far away. Orange is also a colour associated with food and with India, so it was a perfect choice. The interiors have been designed by my husband Anil’s design company, Bathwal Inc. They specialise in a holistic approach to their projects. Hence, everything associated with the restaurant – the interiors, logo, website, menus, packaging, business cards – all share the same tactile feel. The idea behind it is that even though everything is coordinated, it isn’t too precise or too matchy-matchy. The first thing you notice when you walk into a TKRC location is the visual stimulation of the open kitchen and the Bollywood-influenced peeling posters on the weathered walls, both reminiscent of Indian ‘dhabas’. Next, you are greeted with the succulent scent of foods on the grill and warmth of buttery parathas. The sound of urban-Indian music floats through the air. When you receive your order, you sit down at the wooden tables and unwrap your roll, with your mouth watering at the anticipation of all the tangy spices. As you take the first bite and close your eyes, you’re transported back to the street carts of Calcutta… it’s a very sensory experience all around. We’ve made a concerted effort to give our customers a 360˚ experience. Every item on the menu has been conceptualised to provide as authentic a taste and experience as possible. Overall, when you eat at TKRC, you should be transported back to India, even if only for that moment. That was the concept with which I started the business and it still holds true today. Although I love every roll on our menu, I do rotate my favorites. Even though our core menu stays the same – a base of 13 different kati rolls – we do add something unique to our menu every year, Last year, celebrity Chef Angelo Sosa created a shrimp masala roll for us, and this year we introduced organic chopped salads with Indian-inspired dressings and organic mango lassi. We are also committed to offering our customers healthy food. Hence, all of our meat is halal, our chicken is hormone and antibiotic free and our vegetables are locally sourced. We make our breads fresh daily and also offer a whole-wheat roti wrap instead of the traditional paratha. These days I am enjoying the chicken roll, which is made from hormone and antibiotic free chicken. When Bathwal Inc. designed the look and feel of TKRC, they did so in such a way that every aspect of the restaurant served as a marketing opportunity. From the selection of the locations, the bright orange signature colour and the open format of the interiors all helped in educating, attracting and retaining customers. For example, all of the locations have open kitchens where customers can see their orders being prepared, hence reminding them that kati rolls are street food and prepared daily from scratch. The eateries are also located in areas with heavy foot traffic and the exteriors feature large open windows so those walking by can also see inside. To-go rolls are served in special heat-retaining bags branded with the logo and presented in a larger, clear carrying bag. And we also offer grab-and-go prepackaged organic salads and mango lassi branded with the TKRC signature style. Given the fast-food price point of TKRC, good service for us means excellent customer service and maintaining an open dialogue with our customers through things like social media and mobile apps. Our customers are very loyal to us and we, in turn, respect them by offering the best ingredients for our type of food. Ultimately, it’s the taste and quality of the food and consequent word-of-mouth that has been our strongest marketing tool. Our loyal customers are our best advertising. We have a strong social media presence and also employ QR codes so that we maintain a close and open dialogue with our customers. The restaurant industry in New York City is very competitive and so in order to receive favored status with our suppliers and consequently access to the best ingredients and services, we made it a company policy to pay our vendors on time. When we choose suppliers, we look for those with whom we can have a long-term relationship whether that is with our current state or potential future growth. Keeping a good relationship with suppliers is the key to our operations. We had to be careful about our equipment since our restaurants are housed in small spaces. We had to make sure that everything could fit. So often times we have had to place custom-orders for our cookware, both from within the US and for more specialized equipment imported from India. I don’t think we can compare ourselves to say a McDonalds since they offer a different type of cuisine and experience all together. However, as far as ‘ethnic’ food goes, perhaps we can say we fall under the same category as Middle Eastern falafel joints or Mexican burritos. Many of these businesses have not evolved into chains as of yet, so it’s hard to gauge it. That being said, maintaining your image as a popular fast-food eatery is more than just delivering consistently good food; it’s about managing your brand as carefully as your cuisine. We have a central office which oversees all four locations making sure that every aspect of the business – not just the food – is presented in a cohesive and holistic manner. We are lucky that we have not seen a slow down due mostly in part to our loyal customer base and the fact that our pricing is very affordable. Indians staying at NY have been our foremost champions as early acceptors. The taste of our kati rolls is very authentic and many of them say that it reminds them of home. I remember we even had one customer who celebrated eating his 600thpaneer roll with us. When he arrived, we had cake and champagne waiting for him. He was so happy that he included TKRC in his wedding a year later. Since we are in the hospitality industry, our employees are in direct contact with our customers. Hence we take great care in choosing our employees. We employ tactics like top grading to ensure that we get the most qualified and effective employees. We also hold regular meeting rhythms so as to share common goals, measure benchmarks and work together as a cohesive unit. We also make sure that each member of our team is trained in multiple areas so that they can rotate responsibilities when needed. We demand a lot from our employees, but to reciprocate their loyalty, we make sure that each member feels like an important and valued member of the team – both financially and socially. Hence, the practice we foster most amongst our employees is an open-door policy, where they are encouraged to share their concerns, practices and achievements without hesitation. When I first started the business, one assistant and I were cooking all the food, grinding the spices and preparing the rolls. Basically, we were doing everything from start to finish ourselves. Today, we have a staff of 50+ employees spread across New York and London, and many of them have been with us for a long time. We encourage a family-type atmosphere here because we want our employees to be satisfied with their work environment. We regularly encourage staffmembers to come to the corporate office and enjoy a home-cooked meal with us. It’s a time to connect on a more personal level. Additionally, since many of our employees are immigrants, often times unskilled, I have set up an internal company fund where 5 cents of each roll sold is set aside to provide financial assistance for further education or entrepreneurial ventures for our employees. Right now, one of our workers is on his way to finishing his undergraduate degree. I strongly believe that the team spirit is encouraged amongst our employees and that has directly impacted the growth of TKRC. Their commitment to each other and to the business fosters a loyalty that is evident in their work ethic. They go the extra mile and that result in satisfied customers; it’s a win-win. All of our locations’ interiors are designed with recycled materials. We have used “green” cement, installed LED lighting and have fixtures designed from reclaimed wood. All of our food packaging is made from recycled materials and we use environmentally friendly cleaners within the restaurant. Finally, our vegetables are locally sourced which helps keep our carbon footprint down. We have been getting franchising offers since we first opened in 2002. Currently our locations are owner-operated. However, we are in the process of obtaining franchising licenses and streamlining our processes so we can offer franchises in other States. We are also developing a centralised commissary that will serve as supply central for all TKRC locations. Restaurants should consider updating their menus and ambiance to reflect an international dining experience. This includes expanding the menus and introducing more fresh and healthy items. ‘Indian’ food is now considered less exotic than in years passed. Restaurants should embrace this trend and experiment with new dishes and techniques. Chefs are not as important in a fast-food eatery, but a good manager can make or break a location. The manager must love the food and have a passion for all aspects of the restaurant in order for it to be successful. Passion of course, but more than that, you need to be in tune with your business so that you understand its rhythms and its course. This way you can anticipate its needs now and in the future. Also, it’s important to stay up-to-date on what is happening to the industry as a whole and how you can grow and stay current without sacrificing your core essentials. Lastly, listen to your customers and ask their opinion; you can learn a lot from them. The journey has been amazing. When I opened the first location of TKRC in New York City, there was this huge learning process. I had no prior experience of running a restaurant; everything I had learned, I did by trial and error. New York City’s hospitality industry is heavily regulated and so when we first opened, there was a definite learning process on how to operate legally in this city. However, eventually we were able to streamline our processes according to what is required here. There were many other challenges – long, long hours– but once we started seeing a positive response from our patrons and the NYC press, I knew we were onto something. I had no idea that kati rolls would become so popular! My strength is that I love what I do and a strong and loyal team surrounds me. Stress and work pressures are always there, but knowing how to delegate tasks and trusting that the tasks will get done helps alleviate some of the pressure. Other than that, I have tried to maintain a calming work environment in terms of our office space; it’s very open, full of light and with little clutter. Finally, I try to maintain an atmosphere of approachability and teamwork throughout the company, when everyone around you is feeling connected, the overall stress levels are reduced.